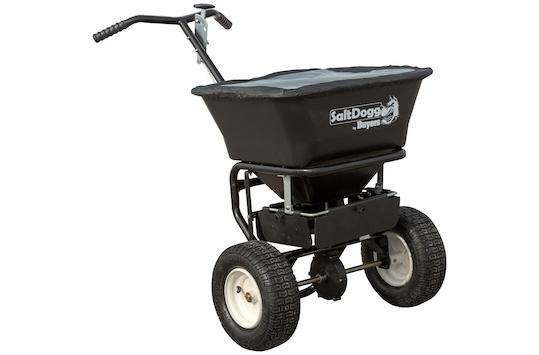 Buyers Products SaltDogg Walk Behind Broadcast Spreader gives contractors, facilities managers, and property owners the ability to broadcast bagged salt or ice melt up to 24 ft with ease. The spreader's new enclosed gearbox with commercial grade alloy gears and an integrated grease fitting ensure that the moving parts of the spreader are out of the elements and are easy to maintain for years to come. Overall Width (at top): 26.50 in. Spreading Width Range: 3 To 24 ft.
Poly hopper won't rust or dent and holds up to 100 lb of ice melt or bagged salt.